Ever since I was a kid I have always loved turning leftover protein into salads, and then sandwiches. 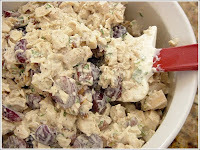 Of course, what I mean by this is chopping whatever chicken, beef, pork, lamb, hard boiled egg, etc., remains from dinner into little bits and mixing it with gobs of mayonnaise, then heaping the mixture onto whatever type of bread was available. Not exactly the most elegant preparation, but it always got the job done. It never actually occurred to me at the time that you did not have to wait for leftovers, you could prepare the meat specifically for this purpose, and that the addition of a few other ingredients could turn ho-hum, overly mayonnaised salads into some truly spectacular sandwich fillings. Hence, over the years my love of mixing meat with mayo has not diminished one bit, but has undergone quite an evolution. My friend and coworker John has been bringing this chicken salad to work for lunch the last few weeks that intrigued me quite a bit. 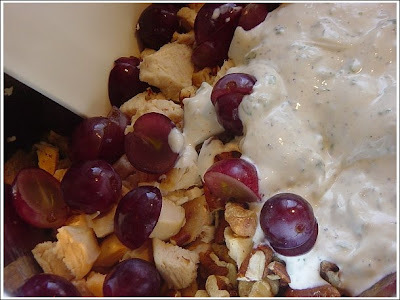 A slightly modified version of a recipe from the Barefoot Contessa (recipe link at the end of post), it starts with roasted, skin-on, bone-in chicken breasts and combines the meat with mayo, sour cream, some toasted nuts, grapes, and tarragon. I wanted it immediately the first time I saw him take it out of his lunch bag and heard him describe the recipe. When my other friend and coworker Diana came in last week with some chicken salad of her own, the same recipe, I knew I had to make it as soon as possible (which turned out to be last Friday). The thing I love about making recipes that others have made is that the recipes have already been tested and any possible trouble spots are thus easier to avoid. This recipe is a good example, as it calls for 2 teaspoons of salt (yes, 2 whole teaspoons) to be added to the dressing, hardly any of which is necessary. I knew this going in, and cut down the salt dramatically. I also knew that the dressing amount could be cut as well, and I used seedless red grapes instead of green. 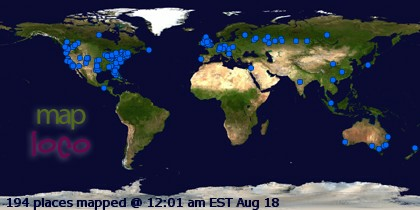 All information gleaned from discussions with my friends. If you don't have your own personal recipe testers, a great thing to do is find a recipe website, like Food Network or Recipezaar, that has user comments along with the recipes. You can pick up many great tips from countless others who have tried the recipe before you. For this particular recipe I doubled the chicken, halved the mayo and sour cream, reduced the salt to 1/4 teaspoon (and I'm not sure it even needed that), and reduced the nuts by half. Although the recipe was intended to produce a salad eaten on a bed of lettuce, I could never eat chicken salad this way knowing I'm just 2 slices of bread away from sandwich heaven. I found this particular recipe to be quite good, the grapes added a nice refreshing burst of sweet flavor that I found to be a nice accent. And tarragon is fast becoming one of my favorite herbs, as I find it pairs extremely well with poultry. 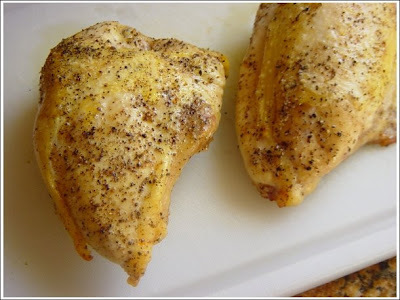 The real keeper though from this recipe is the easy and delicious chicken preparation. The meat came out cooked perfectly, and starting with bone-in, skin-on chicken breasts really kicks up the flavor while reducing the price tag (don't be a boneless/skinless chicken snob). 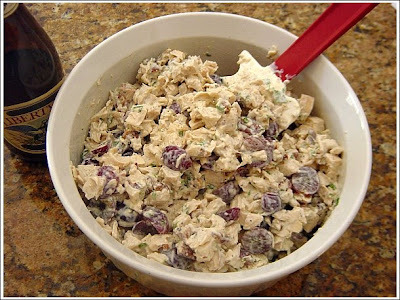 I'll definitely be using this particular prep whenever I make chicken salad from now on. I have never done the Veronique recipe, but Ina's broccoli chicken salad recipe got rave reviews. Check it out, too. This is the only way to make chicken breasts for such recipes (and for casseroles). Now, I buy the big packs and just roast it all at once. Works perfectly every time, and I freeze it in 2 cup batches!